The Best Spots on the East End of Long Island! 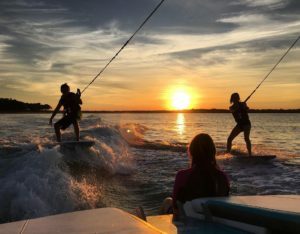 We often get questions throughout the summer asking about secluded, quiet areas, for charters, jet ski rentals, and kiteboarding lessons. Although the entire East End is beautiful, sometimes it can be hard on weekends to find your slice of paradise. But, we have plenty of options and know the best spots around the area. Checkout our list below of some of our favorite places! Jet skis running along Long Beach Bar in Orient. Orient is the perfect place to spend your day and a favorite among everyone here at PWS. A must-see stop on our jet ski tours, Orient Bay is usually wind protected and boasts a large stretch of sandbar that connects to Orient Beach State Park, perfect for calm water and kiteboarding when the wind is out of the south, southeast, and east. Sights include Bug Lighthouse, Gardiners Bay, and Shelter Island. As you head further inside Orient Bay towards Orient Beach State Park you enter the large and hidden Hallock Bay. 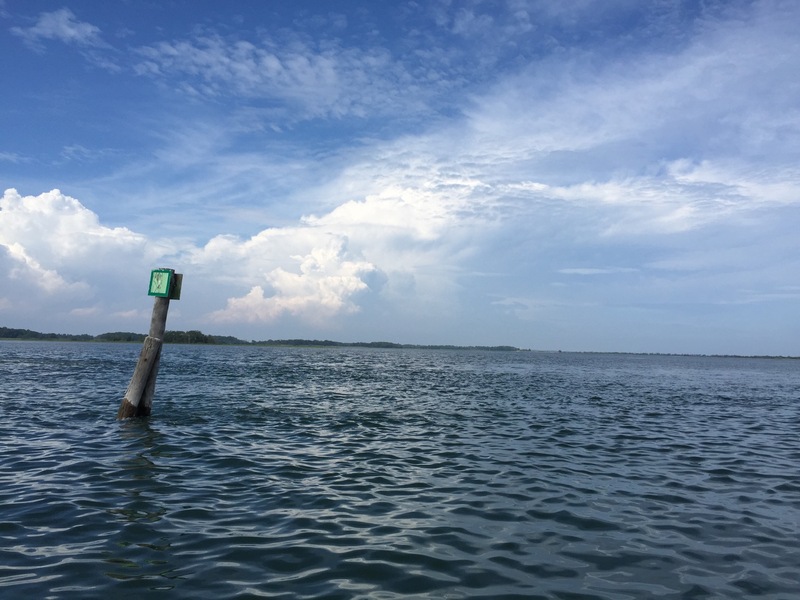 This bay is perfect for sighting wildlife, including birds and turtles. 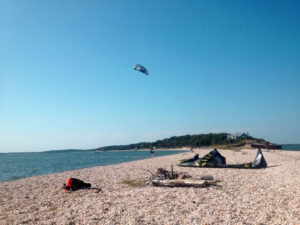 It is almost always protected from the wind and is a hidden gem of the North Fork for everything from swimming to kiteboarding. Want to check it out? Our Orient Point Jet Ski Tour stops here, weather and tide dependent. See picture above! Menhadden Lane Beach – Shelter IslandOn the east side of Shelter Island across from Bug Light House, Menhadden Lane Beach is a large, shallow and sandy beach at low-tide perfect for swimming and relaxing. Protected against everything but east wind, we frequent this spot on busy weekends for jet ski tours and water sports charters. The water is often very clear because of constant circulation giving you visibility up to eight feet down! 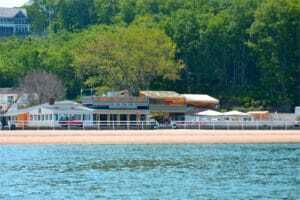 Crescent Beach (Sunset Beach Hotel and Pridwin Hotel) – Shelter IslandOne of the most popular destinations on the East End by boat, Crescent Beach is home to the Sunset Beach Hotel, a popular place among celebrities. During the week this beach is quiet and is a great place to relax and swim. The weekends can prove to be very busy, as the cove often fills up with over 100 boats. Be sure to check out the various seaplanes that fly in and out. Chances are if we pick you up in Noyack, this will be the first place you will see. Jessups Neck is a protected state park with beautiful scenery of Shelter Island, North Haven, Southampton, Nassau Point, and Cedar Beach. Jessups provides ample protection from the wind on both sides. Looking for peace and quiet? Checkout the west side in Little Peconic Bay! 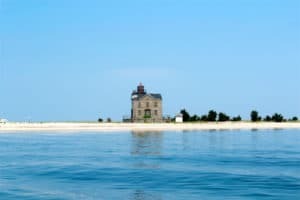 Nassau Point – CutchogueOne of most private and secluded areas on the North Fork, Nassau Point is home to a large sandbar with an island at the tip at low-tide and perfect coves for protection from the wind. 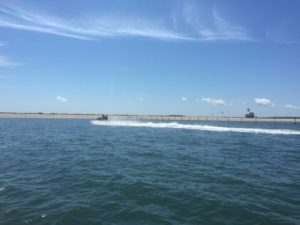 When you don’t want boat traffic and want to get away from the hustle and bustle of the Shelter Island vicinity, Cutchogue and New Suffolk are perfect. The Nassau Point sandbar is a favorite spot among kiteboarders. If it is low-tide be sure to walk the entire length of the sandbar and standout in the middle of Little Peconic Bay. Robbins Island is a private island owned by hedge fund manager Louis Bacon and a popular day spot among locals. The North Race sandbar is great for hanging out and the cove provides great protection from the usual southwesterly winds. When west wind is strong this is a great kiteboarding spot. The South Race is a little bit more exposed, but usually less crowded. Be sure to check out the large dune hills in the area and wildlife around the island. Cedar Point Lighthouse on a Beautiful Day. One of the oldest lighthouses in the area, the Cedar Point Lighthouse is our halfway point on our Around Shelter Island jet ski tour. The lighthouse is made entirely out of granite and has unrestricted views of Orient, Plum Island and Gardiners Island. The beach is perfect for swimming while the cove inside provides protection from the wind. Want to know more about the lighthouse? Just ask your tour guide! Want to see some of these spots? Just ask! We love taking people to these great destinations whether it be a charter, jet ski rental/tour, or kayak tour. Send us an email or call us at 631-680-0111 to book your next adventure. 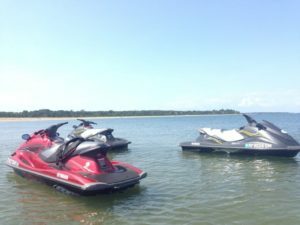 For more information on our jet ski rentals and tours, including tour maps and pictures, CLICK HERE! Book your next water sports charter or private event today!